It is not easy to remove animal odors from your home. There is usually a mess of guano, urine, and feces to clean up. These substances can seep down and contaminate wood, drywall, insulation, and flooring. 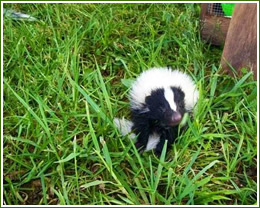 A skunk could spray under your house leaving your home with a very unpleasant odor. You may find yourself with a dead animal smell in or around your home. Our professionals at Chattanooga can handle any odor control Chattanooga situation. Make sure to visit our restoration page as your drywall, supporting joists, and insulation may been damaged. Contact one of our friendly staff today and let them help with your odor control problem. We can help you with removal and restoration of damaged and soiled areas in your home. Left untreated these damaged areas will not just have the odor go away. It could be made worse as dead animals and feces can attract other animals and insects. There is also a potential of diseases that could affect you or your pets. let us find the source of your odor problem, clean affected areas and apply counter agents to eliminate the odor for good. Removal of the odor source is the first step. If we can’t remove the source, we will use aerosols, oxidizing agents, and disinfectants with germicides to cover the smell, until it dissipates.